Moving north from Plaza De Espana, you will find Calle de la Princesa, a street that will take you to Argelles and then on to Moncloa. The first of these two districts has new and elegant buildings, usually four or five-storeys high. Streets criss-cross in a rectangular fashion and parking is not difficult, as there are good underground car parks, which are quite common in Madrid. To the west of Argelles you will find the Parque Del Oueste, one of the few green areas in the Spanish capital. For shopping or any other necessities, you will find everything you need in Calle Princesa. At the end of this road you fill find Moncloa, home to the Ciudad Universitaria, a huge university campus with all the faculty buildings and well-kept sports facilities. 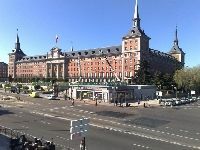 Close to the university there is Palacio de la Moncloa, residence of the Spanish prime minister since 1977.